The Kickflip Quake mod brings some of your favorite skating moves into the shooter for some fun Tony Hawk throwback action. Love Tony Hawk? Love Quake? Then you need to play the Kickflip Quake mod. 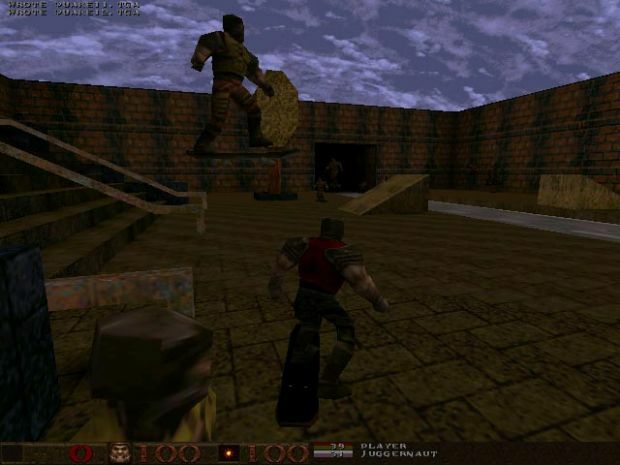 This crazy fun skating mod for the classic shooter Quake originally released in 2000, nearly 20 years ago, but we're bringing it to you now. It's been making the rounds on social media, because it's indicative of a very special time in the timeline of Quake mods. It's got everything you could ever want: skateboarding, ska, and classic Quake. What more is there to say? It doesn't appear that it's been updated or anything like that since 2008 at the latest, via the page's official ModDB page, which lists its final version coming out that year. That doesn't mean you can't still get in on the fun, though. With Tony Hawk games not releasing much anymore (or coming out as veritable trash in some instances) this is your chance to wallow in the "could-have-beens" of yesterday. The mod is so old that there's even a Geocities page for it that's still working, which was mirrored from Geocities at the end of 2009. That's insane. If you're planning on getting some serious ska and skateboarding in (ska is the first three letters of "skateboarding, after all) you can download the mod via ModDB. And if you've never applied a mod to Quake before, there's a very simple way to do it hosted over on Github here. In the meantime, what are some of your favorite Quake mods? And if you're not well-versed on Quake, we've got just the longread for you.